Clearwater Beach is a barrier island connected to Clearwater via the Clearwater Memorial Causeway, an elegant four lane fixed span bridge. 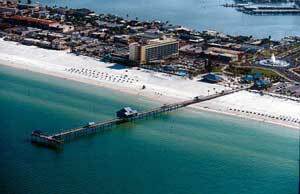 Clearwater Beach is a very popular and touristy beach destination for visitors and Floridians alike. 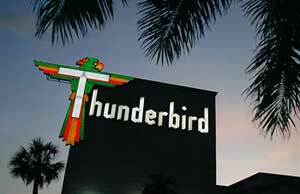 Along the strip there are many beach apparel and gift shops along with trendy restaurants. Visitors traveling south on the Sun Coast Trolley will cross the Sand Key Bridge, heading towards Indian Rocks Beach. 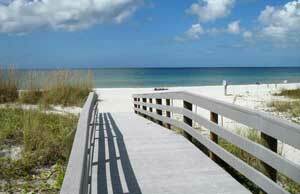 Indian Rocks Beach is popular destination due to it's free beach access parking. Gulf side, it has white sandy beaches, high rise condos and cottages along with businesses and restaurants, while the other side is the Intracoastal Waterway with canals, docks and residential housing. Visitors to the gulf beaches will find the Kooky Coconut, a sandwich shop near the public beach access that provides delicious snacks, Cuban sandwiches and frosty drinks. 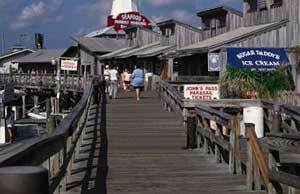 Madeira Beach is best known for the sea-themed John's Pass Village and Boardwalk. An unique retail shopping district with a variety of restaurants, the local fishing fleet, dolphin watching and shelling tours, boat rentals, parasailing and jet skiing. It's easy to tell when you have reached Treasure Island, the Thunderbird Resort is a tall and well-known landmark, but the most distinctive feature on Treasure Island is the wide white sandy beaches set back far from the shore. Not only is the beach perfect for an afternoon in the sun, it is also beautiful after dark, and visitors can join in with Drumming on the Beach every Sunday night, until 10pm. 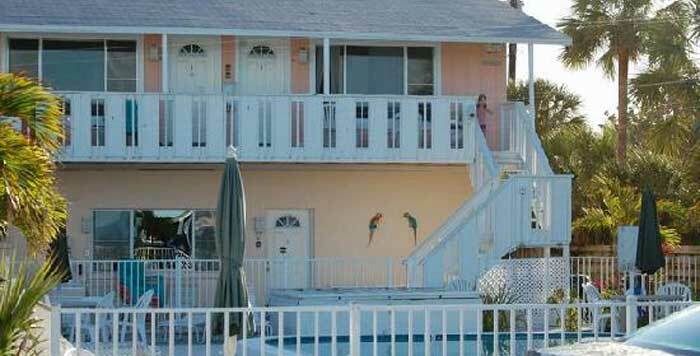 St Petes Beach has many great restaurants and attractions. 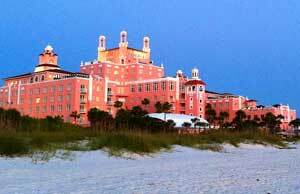 The Don CeSar Hotel, built in 1928, and is locally known as the Pink Lady, is a visible and historic landmark. There are many style of accommodations available, from resorts, condos, and cottages, to bed and breakfast. Gulf side has the white sandy beaches, and along the Intracoastal are mangroves, marinas, plenty of sea birds, restaurants, and shops. Further south is Fort DeSoto Park, the ferry to Egmont Key, and the Skyway Fishing Pier.